Passed away suddenly on 23.3.2019. Beloved wife of John (dec). 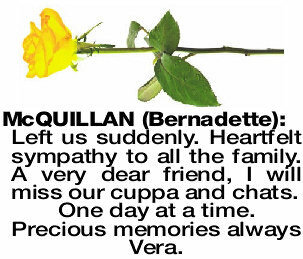 Loving mother of Declan, Deirdre, Brendan, Fiona and Helena. Cherished Grandmother and Saint to many. Forever loved and will be sadly missed. 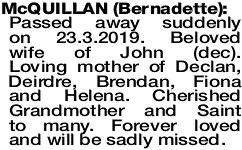 The Funeral Mass for Mrs Bernadette Mary McQuillan of Lynwood will be celebrated in St Jude's Catholic Church, 20 Prendiville Way, Langford commencing at 2:30pm on FRIDAY (05.04.2019). Cremation will take place privately at a later time. For my dear sister who passed away suddenly. We will have treasured memories always. Our thoughts are with her family. 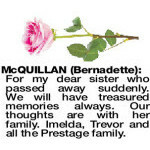 Imelda, Trevor and all the Prestage family. 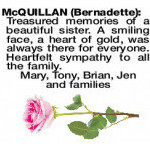 Treasured memories of a beautiful sister. A smiling face, a heart of gold, was always there for everyone. 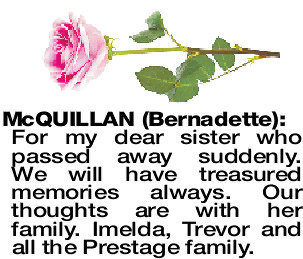 Heartfelt sympathy to all the family. 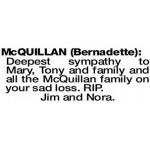 Deepest sympathy to Mary, Tony and family and all the McQuillan family on your sad loss. RIP. Fond memories of our dear friend. 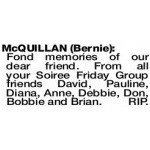 From all your Soiree Friday Group friends David, Pauline, Diana, Anne, Debbie, Don, Bobbie and Brian. RIP. Left us suddenly. 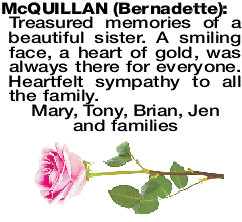 Heartfelt sympathy to all the family. 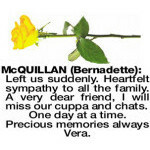 A very dear friend, I will miss our cuppa and chats.